This image gave me such a good laugh that I needed to share it. Wanderingstan uploaded some 1973 German catalogues to flickr and Gilligan from retrospace posted a slideshow he had made from the images. How can one man look so macho AND ridiculous in the same shot? 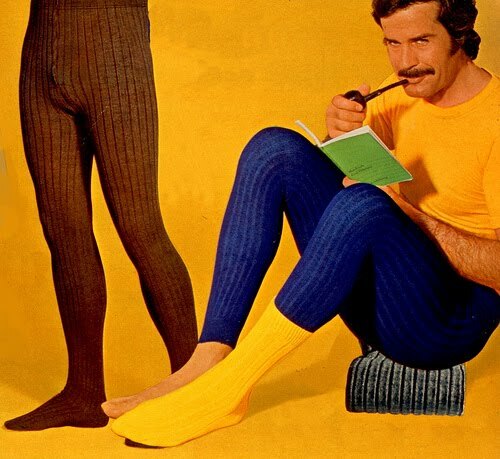 The next picture really made me giggle when I imagined how Ebbo would have looked sporting these high fashion dungarees. 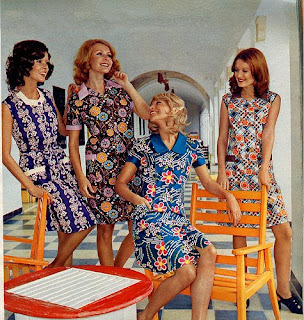 Although the catalogue is generally a fashion horrorfest, I actually quite like these dresses. Very Carol Brady. Feast your eyes on the rest of the catalogue (including a seductive underwear section) on wanderingstan's photostream. Thankyou again retrospace for starting my day right. I agree, those are too funny. I agree, those dresses are pretty darn cute. That first image is SOOO funny that I just about did a spit-take with my morning cup o' joe! And just what is the story behind that mischievous twinkle in Mr. Marlboro's eye, anyway? Could it be that he's feeling naughty for having just laid a sweater egg?? Saw these on Retrospace, too, and was amazed at how much German loved yellow!